Since 1965, Euphoria Kitchen & Bath Ltd has offered homeowners custom cabinetry, gorgeous countertops and a tremendous selection of decorative hardware; but, most importantly, we’ve made it our mission to provide nothing short of personalized service. At Euphoria Kitchen & Bath Ltd’s well-appointed showroom—conveniently located in Westchester County, NY—area homeowners can view displays of finely crafted cabinets that represent the exact quality and prestige of the materials we work with on a daily basis. Our showroom also displays granite, Corian and other solid surface countertops, alongside an expansive array of decorative hardware options. We give you the complete kitchen and bathroom experience so you’re able to see the exceptional level of quality—both in brands and materials—that Euphoria Kitchen & Bath Ltd will bring into your home. Euphoria Kitchen & Bath Ltd offers free showroom consultations and estimates of your detailed floor plan/design. If a professional kitchen or bathroom design is what you’re looking for, we offer those services for a nominal fee, reimbursable upon contract. 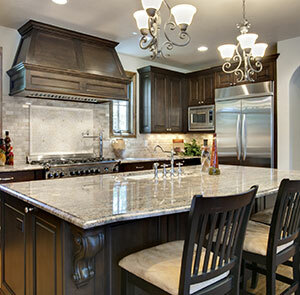 We take pride in personally working with homeowners to design every detail of their kitchen or bathroom, including cabinetry, counter tops, hardware, plumbing, lighting, flooring and all related elements, so that the end result meets or exceeds your expectations. In fact, customer satisfaction is our top priority and we’re proud to say that nearly 80 percent of our business comes from the referrals of satisfied homeowners. On our website you’ll find numerous examples of our work. The kitchens and bathrooms displayed are primarily examples of our custom cabinet capabilities and the bevy of experience we have in tailoring cabinets to meet the needs of individual homeowners. All of our wood cabinets are made to order and come with hardwood maple dovetail drawers and under-mount guides. We use only top name brand manufacturers and pride ourselves on aligning your needs with our capabilities seamlessly, to provide the very best in kitchen or bathroom cabinets in Westchester County, NY. is to make your kitchen or bath a showpiece for your home and we accomplish this by dedicating ourselves fully to its transformation. Whether you’re seeking a complete bathroom remodel or you’re in the market for updated, custom kitchen cabinets in Westchester County, NY, we want there to be no question that Euphoria Kitchen & Bath Ltd is the place to call for quality.